So, is all your holiday shopping done? If not, and you have a writer or reader on your list, I have compiled some gift ideas here. Literary inspired covers for e-readers, smart phones and check books. Wall chargers and battery chargers for phones and e-readers while traveling. Earbuds to listen to audio books. For tea drinkers, a really pretty teapot with some really nice teas. I like the “tea for one” pots that come with a cover that is a cup. Apple TV (or similar) to stream movies based on books. I know this is a big splurge, but for some of you it may be the perfect gift for someone. Fitness monitors that beep to let you know it’s time to get up and move. Good for writers. Restaurant gift cards so you don’t have to interrupt reading and writing to cook! 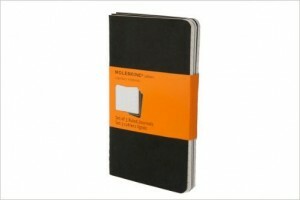 Molekine journals— They aren’t fancy, but they have been favored by writers for decades. There are a wide variety of sizes and paper, including ones for artwork. Pens glide over this paper smoothly, and this brand has been celebrated down through the years. They are easily available online. Of course there are many other, fancier journals out there too, but Moleskine has this long tradition that it is cool to continue. 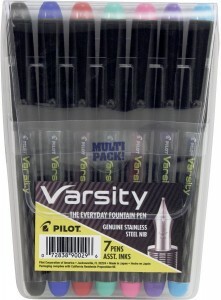 Pilot Varsity disposable fountain pens in assorted colors. I have these and love them. They are inexpensive and the colors are fun. Fountain pen writing is old-fashioned, but a pleasure. You can usually find the set for around $15 at the big A, but some online vendors charge much more. Reader-oriented jewelry. Go to Etsy for this. There are vendors there who make and sell earrings and bracelets and other jewelry with either quotes or images from Jane Austen and other classic authors. Others just sell book-oriented jewelry. On a recent visit I was attracted in particular by cute earrings composed of stacks of tiny books, and by a charm bracelet chock full of Jane Austen images and quotes. 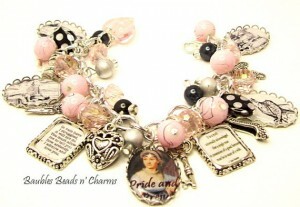 Search for Book Jewelry Handmade, Literary Charm Bracelets and other similar word combinations. If you know your classical author of choice, just plug in that name. Make sure the seller will mail at once so you can get it in time. Stand up desk. These may take time to get used to, but getting out of that chair is good for writers! Pricey, but it may be just what your writer wants or needs. 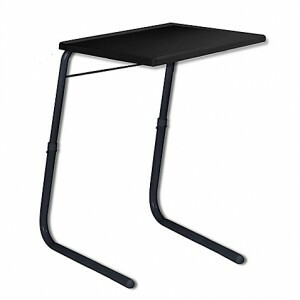 Tablet easel or prop/stand for iPad or other tablet. These allow for easy reading at a table or on a couch, or for easy viewing when following a recipe in the kitchen. There are many choices from pillow props to metal or wooden ones. Search on your preferred sites for Tablet Stand. Make sure you get the right size, or one that handles most tablets if you don’t know which one is owned. I just bought one for less than $20. T- shirts that proclaim the love of books. These can be found at places like Signals and Acorn, and again at Etsy where you would search for Literary Clothing. A big snuggle throw. Get one that is really soft, but avoid polyester or nylon that traps in heat and moisture. Aim for cotton, wool, or even acrylic. A ruana, also for snuggling and reading, or for keeping warm, but not too warm, at the computer. 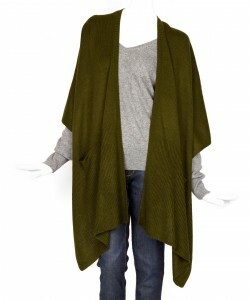 Ruanas are sort of like shawls, but shaped more, and sort of like lightweight ponchos, but split up the middle. I write in my various ruanas all winter. See tips under snuggly throw for fabric content. A reader’s side table. 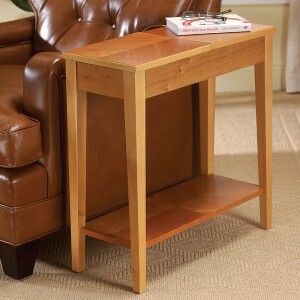 Narrow enough to fit any space, and sturdy enough to hold books and coffee cups, these are practical little tables for a reading nook. The one pictured is from Levenger, which also has other cool reader gifts.